The project LignoValue (2017-2020) aims to obtain valuable bioplastics from wood biomass in the future. It is funded by the German Ministry of Education and Research (BMBF) within the framework of the Scientific-Technological Cooperation (WTZ) with Chile. In collaboration with the team of Prof. Ignacio Poblete (Universidad Andres Bellos, Santiago de Chile), LignoValue will address the production of bio-based polymers from lignin-based raw materials. 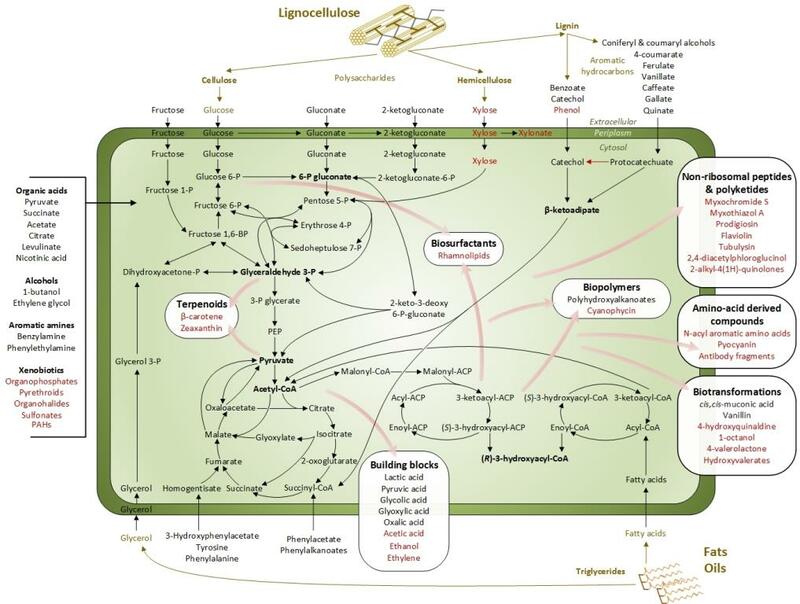 Lignin represents about 30% of the total organic carbon on earth. As the main constituent of wood, it accumulates in huge quantity as side product in the growing bio-economy based on lignocellulose, but so far is simply burned due to lack of higher-value alternatives. In a cascading strategy, lignin will be depolymerized by thermal treatment under high pressure into small aromatics in a first step. For the subsequent aromatics conversion into value added products, we create tailored strains, based on the soil bacterium Pseudomonas putida and related isolates. These bacterial species are known for their high, natural aromatic compound degradation capacity, which is an excellent starting point for the project. One of the challenges is the toxicity of the aromatic substrates. Beckers V, Poblete-Castro I, Tomasch J, Wittmann C (2016) Integrated analysis of gene expression and metabolic fluxes in PHA-producing Pseudomonas putida grown on glycerol. Microb. Cell Fact. 15:73. Link. Borrero-de Acuña JB, Bielecka A, Haeussler S, Schobert M, Jahn M, Wittmann C, Jahn D, Poblete-Castro I (2014) Production of medium chain length polyhydroxyalkanoate in metabolic flux optimized Pseudomonas putida. Microb. Cell Fact. 13:88. Link. Poblete-Castro I, Binger D, Rodrigues A L, Becker J, Dos Santos V, Wittmann C (2013) In-silico-driven metabolic engineering of Pseudomonas putida for enhanced production of poly-hydroxyalkanoates. Met. Eng. 15:113-123. Link. Poblete I, Becker J, Dohnt K, Dos Santos V M, Wittmann C (2012) Industrial biotechnology of Pseudomonas putida and related species. Appl. Microbiol. Biotechnol. 93:2279-2290. Link.